And Ron Campbell of Kennewick, WA is stayin' alive with his Mirror Ball Skull in full action(originally posted here). 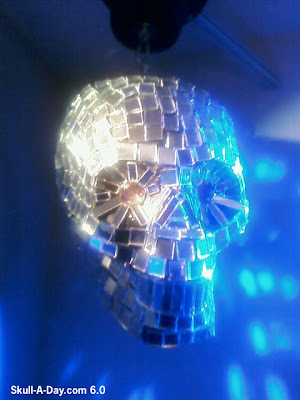 Ron's proving that disco isn't dead, it's just trapped inside your skull waiting for a glamorous light show to reveal it's self. As the saying goes, "Good things come to those who wait". Patience has a lot to do with creating art, and the end results are almost always worth the wait. Thanks to both of you for sharing your time and art with us. Now let's BOOGIE!!! I'm a big fan of the incredibly talented photographer Bill Wadman, so I was delighted that he agreed to the task. 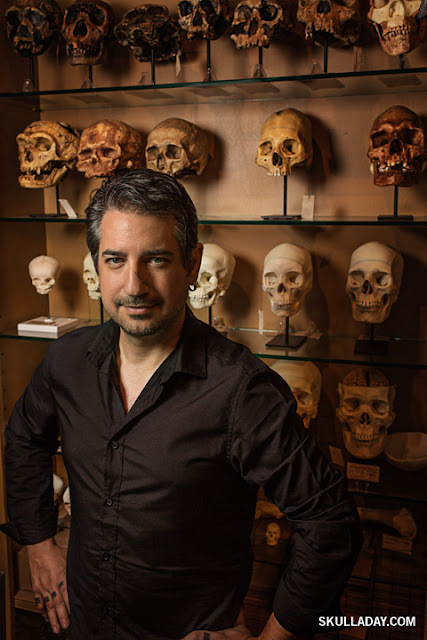 The next piece was securing a location and thanks to my friend Symon Chow (another incredibly talented photographer) I was able to get connected to the fine folks at The Evolution Store, an amazing cabinet of curiosities in NYC – if you've never been I highly recommend a visit. Alex Minott, the manager (and a fine skull artist in his own right) kindly let us use the space for this shoot and all the pieces came into place! Side note, Bill experienced a very unusual camera issue in the process of taking these pictures, which made one of them come out looking quite odd, you can check it out on his blog HERE. 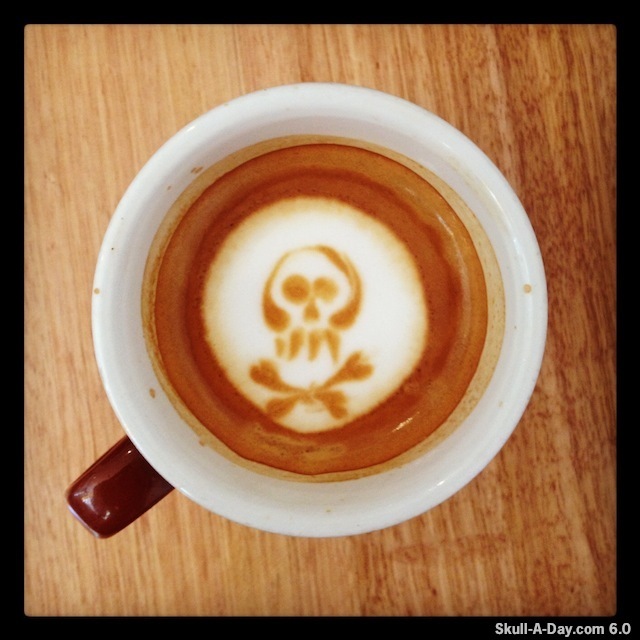 Sean Mears, a barista in Melbourne Australia, created this set of tasty looking skulls. 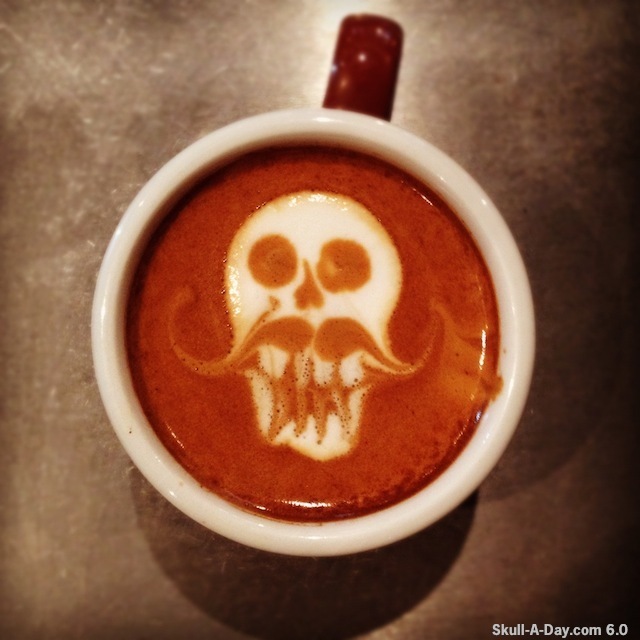 Coffee art is a truly wonderful and amazing gene of art. So much care and energy is put into creating a piece that is just meant to last mere minutes. If there ever was an art form in which the concept of making us remember our temporal place is stressed it would be that of coffee art. Thank you for your eye opening work, both in and on top of the cup. Recently, two of Noah and my friends had a cookout. 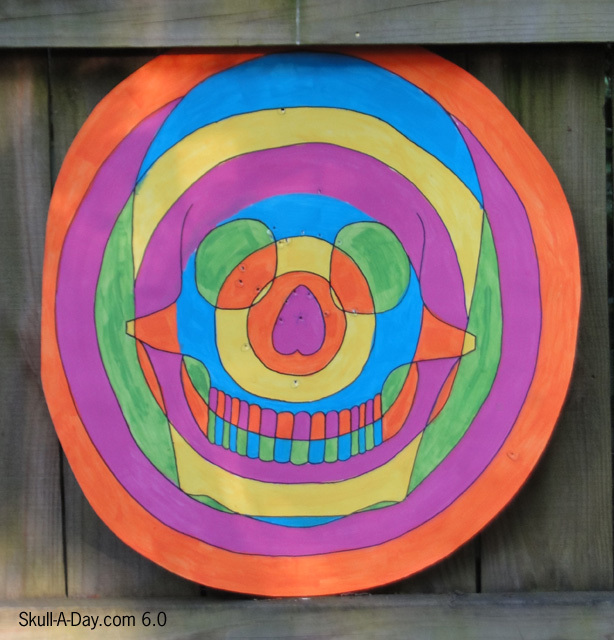 There was a request for targets, to shoot at with bb-guns, so I made a skull target. 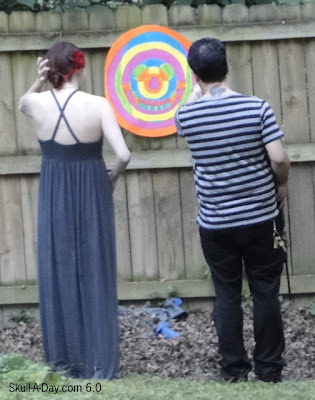 Our friend Nathan holding the target for me. 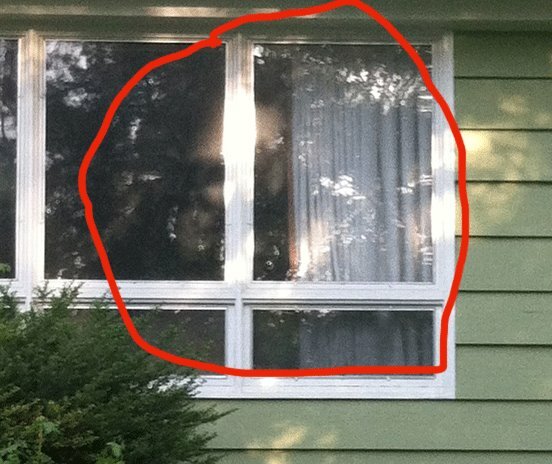 This is after it had been shot several times. You can see the hole in the center of the nose, which has Noah's star around it. Noah and I figuring out where a shot hit. I had wanted to make a skull target for a long time, but had no motivation to make one. This activity was something I had never done, so I made a brightly colored target to mark the day, and give other people something different to shoot at. I used a pencil to draw the design. 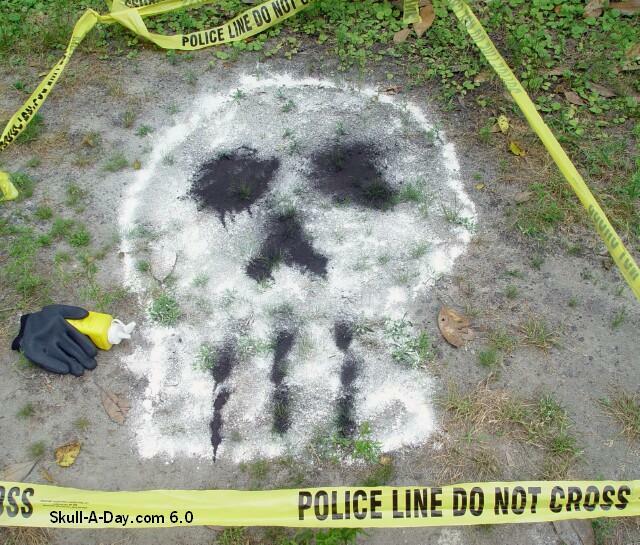 Then, I used a black marker to trace the skull lines onto a large piece of white poster board. 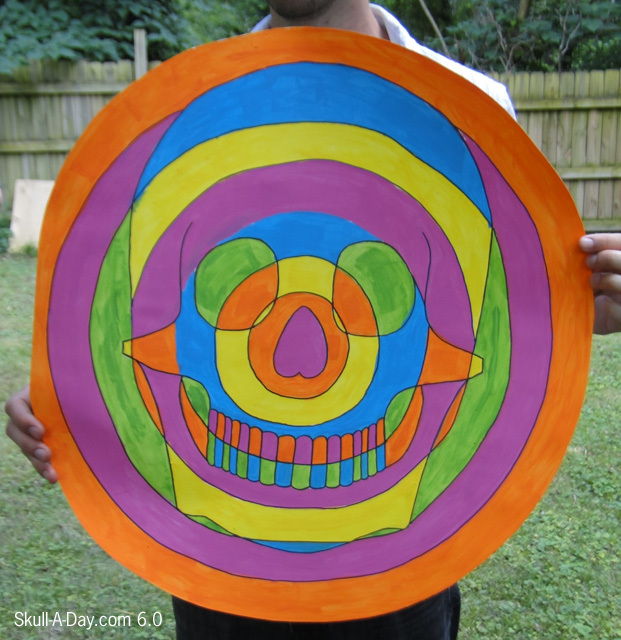 I used bright acrylic paint and a foam brush to paint the rings, so the colors alternated where the skull design intersected with the rings. I decided the nose should be the bulls-eye, so I painted it pink. After the paint was dry, I outlined the design with the black marker. Noah was the only person to shoot the nose right in the middle, so he drew a star around it. I managed to be a decent aim. I guess all those years of Mario Bros Duck Hunt paid off. That's creepier than shooting a target as an adult. [CONTEST] Win a Chalkboard Skull Sculpture! THIS CONTEST IS CLOSED. THANK YOU FOR PARTICIPATING! Need something a little quirky for your message writing needs? The team at iamhome has the perfect thing for you, a Chalkboard Skull. "Our chalkboard skulls are life sized (a 20 something year old female) and are made one at a time in our studio. We hand rotocast a silicone mold with urethane plastic, sand and sandblast the skull and spray it with chalkboard paint." 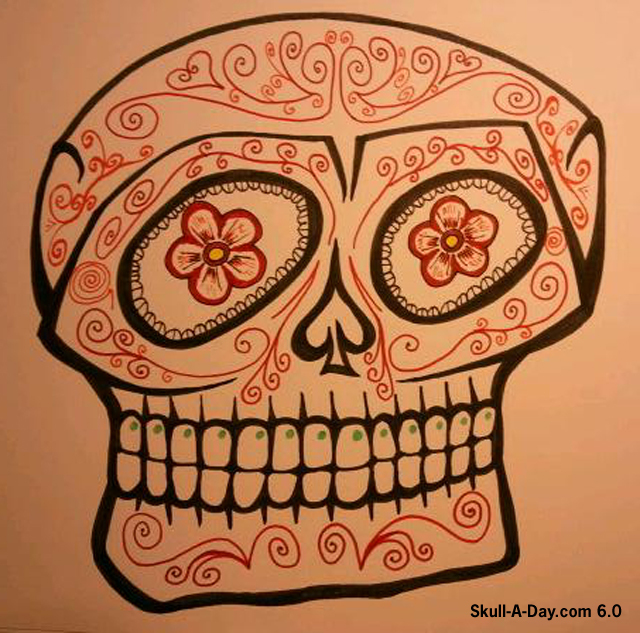 To share the love of skulls, they would like to give away a Chalkboard Skull to one lucky Skull-A-Day fan! "iamhome is a collaborative effort run by Sarah Belknap and Joseph Belknap out of a studio workshop in Cicero, Illinois. Our mission is to produce quality handmade products with a strong design influence and an emphasis on color." 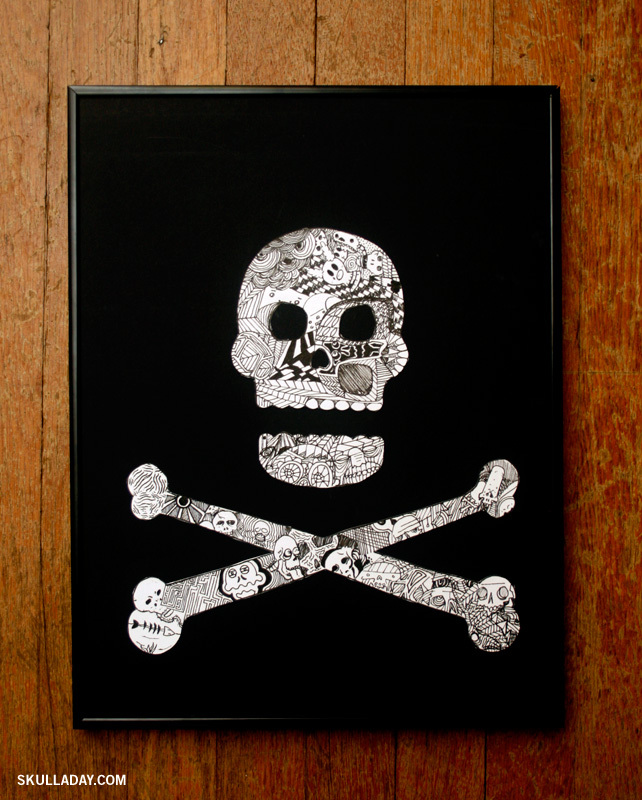 The lucky winner will be receiving one of the Chalkboard Skulls in their choice of black, grey, or mint. Leaving a message on a skull is a great way to get your thoughts known. To enter this contest leave a comment telling us what message you would leave on a skull. It could be a grocery list, a reminder, a poetic musing, or something else. Whatever ever your choice is, please leave the comment below, as your entry. You have until just Midnight Eastern Time Wednesday, July 4th to enter so don't delay! NOTE: iamhome will pay for the shipping to the winner. They will ship First Class for International, and Priority Mail for USA. 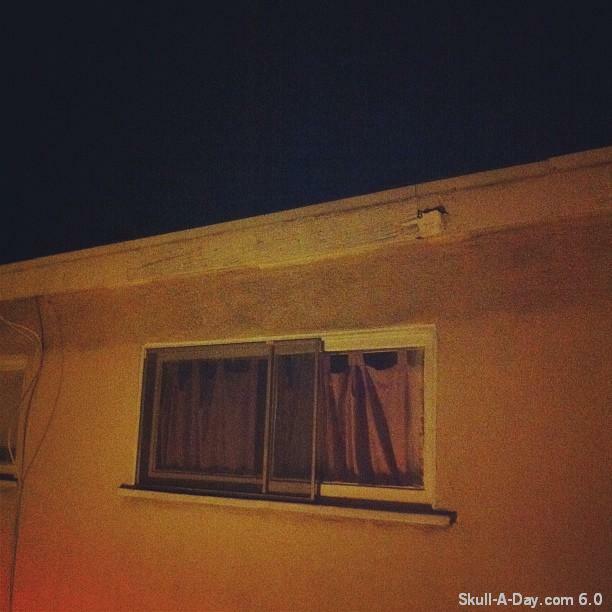 Of course you don't need to wait till the end of the contest to get your own iamhome creation. 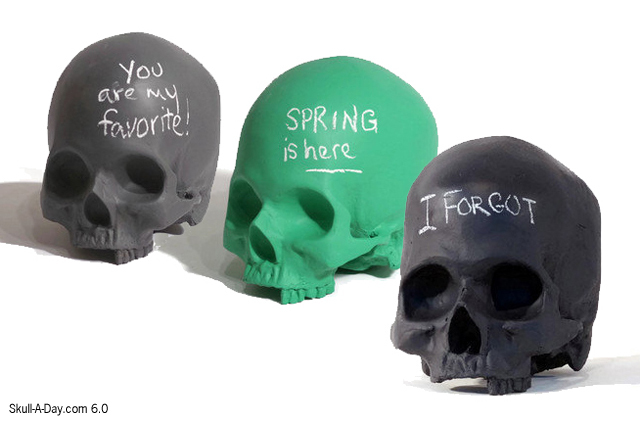 Visit their shop to purchase one or more of their Chalkboard Skulls, in a large variety of colors and two styles. 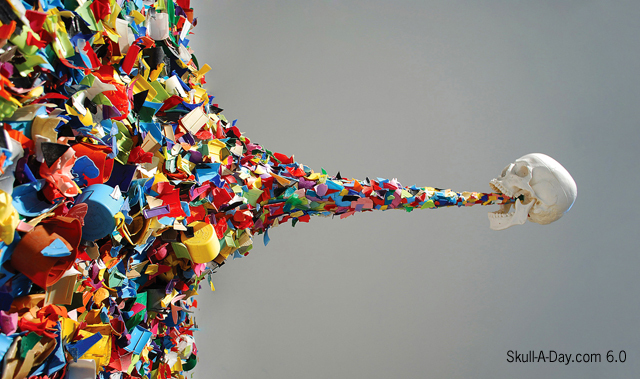 Scott Davies of London, England created this striking image. We all know smoking cigarettes is a deadly habit. This creation shows that clearly. 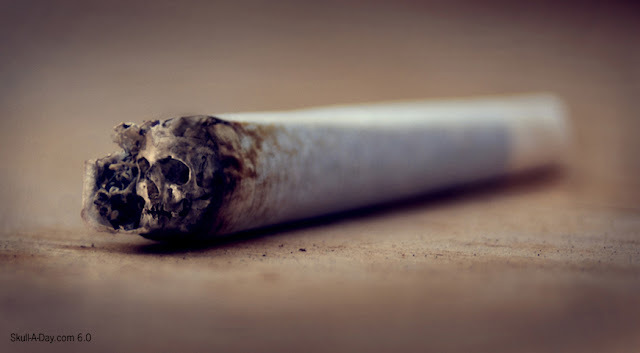 The image of a skull in the burning cigarette is a stern reminder that this addiction can kill. Fiber artist Joanna Lesinski from Buffalo, NY showed us a skull cupcake headband that she created. 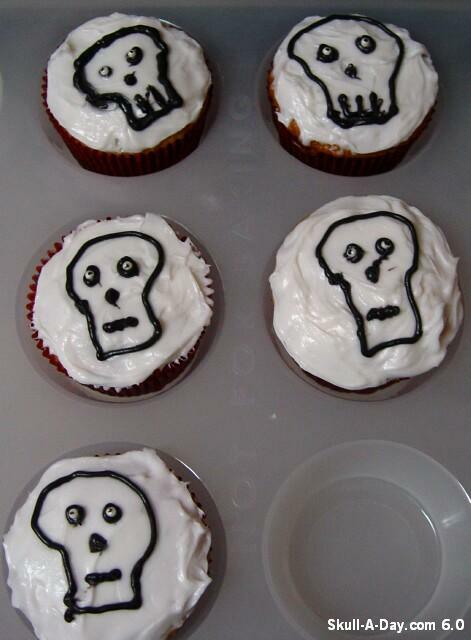 Fluffy cakes decorated with skulls, what a wonderful idea. Looking at this it is hard not to think of a certain cookie dessert treat. Thank you for sending in your work for us to share with others. 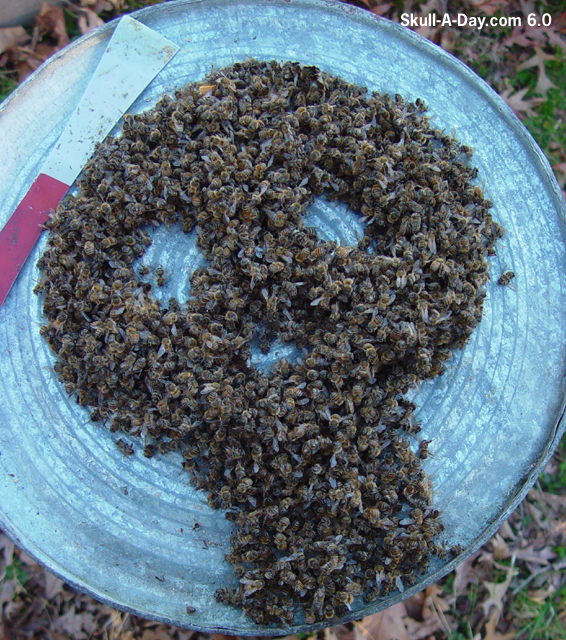 This past winter Skull-A-Day colleague and avid beekeeper Phil Cheney made the most of an unfortunate encounter when he discovered that some of his bees had frozen to death. Even though your hive experienced a loss, Phil, you made it a gain for us with the first ever skull made of bees. Their honey making days may be over, but their spirits will live eternal in the sweetness you have provided. Thanks for that, Phil! 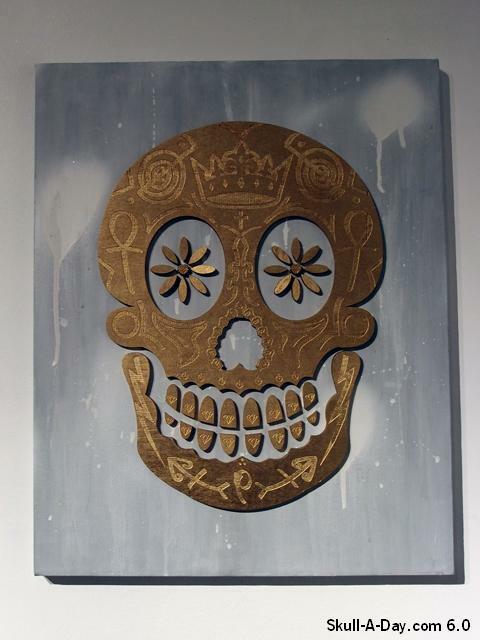 Miami, FL based, TYPOE created these stunning pieces "with plastic skulls and collected spray can tops". 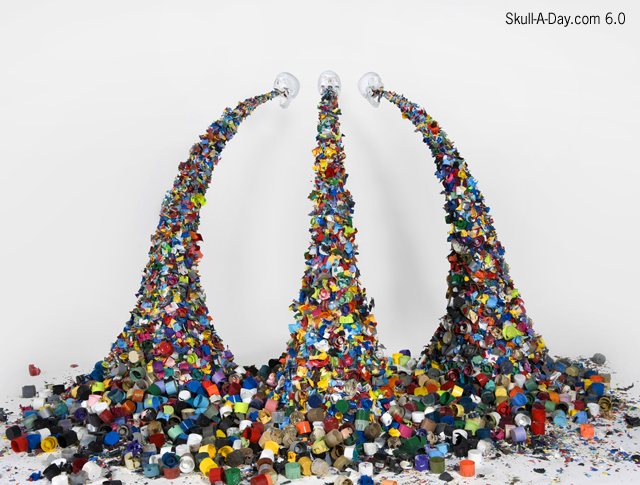 We don't normally post artwork that contains commercially made skulls, but these amazing pieces had to be shared. This artwork speaks to the abundance of spray paint created graffiti, and the huge amount of trash that we create in our lifetimes. It's visually stunning in construction and meaning. I'm glad TYPOE shared it with us! Prolific Simulacra Hunter and skull creator, Tom Adams, has added two more to our collection. Thank you so much for always sharing your pictures. It is awesome that you have a camera ready on so many occasions to capture them for us. And for the rest of our loyal readers- Keep sending those pictures in, we always love seeing what our skull hunters find. Anyone is welcomed to participate, it's fun and it's easy- if you see a simulacra skull, photograph it and send those pictures in to our submissions address with a little something about what it is really and maybe a little about you. Shawn Burke is plying his artful hands to a mixed media base for some wonderful paintings including a few that feature our favorite subject. The natural color selection that Shawn has chosen strengthens the realism dimension he achieved with both of these. Each piece was created with different tools yet a similar effect is portrayed. 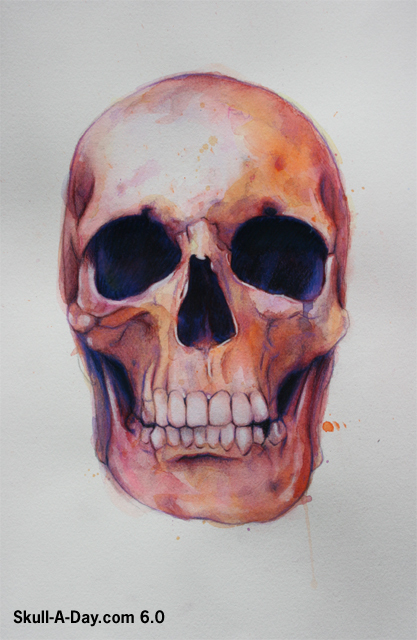 A great study of skulls indeed. Thanks for the lesson, Shawn! I am always in awe of the skill one needs to be able to fashion sculpture from such an difficult and unforgiving material. Thank you once again for sharing one of your creations with us. 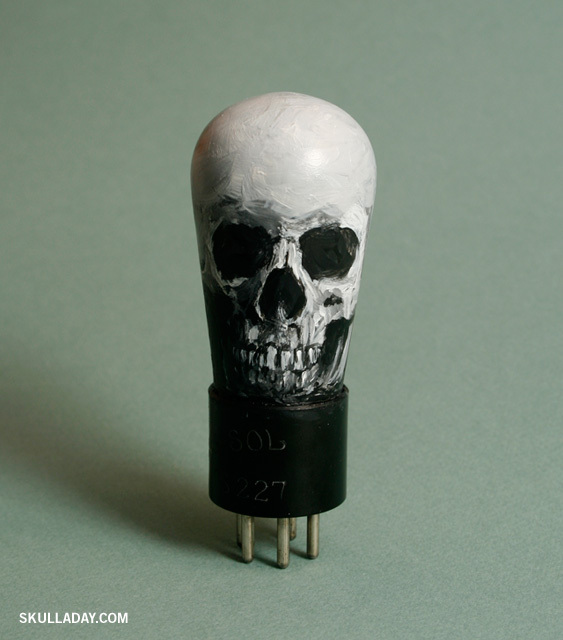 Be sure to flashback to some of Sam’s other Skull-A-Day contributions HERE and HERE. 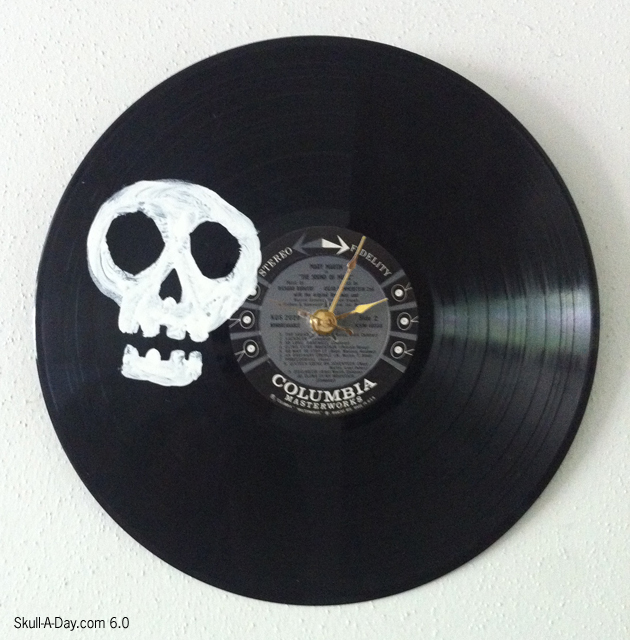 Krista Moreno created a clock from a record and adorned it with a skull. 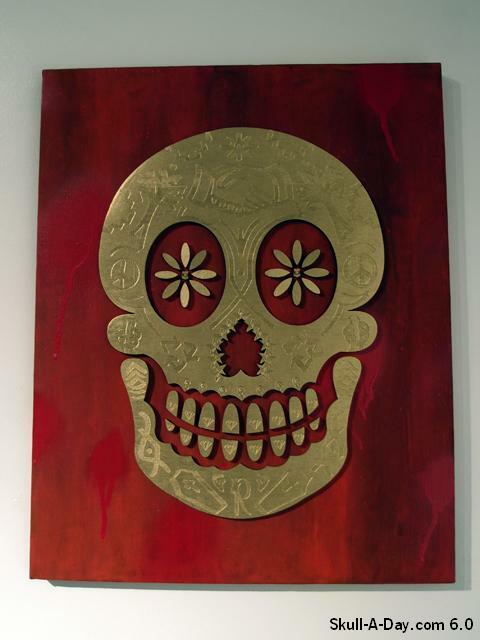 A clock with a skull reminds us that life is short and each moment is precious. Upon closer inspection, and a bit of research, the record she used is "The Sound of Music" soundtrack. Music is a grand way to make life more enjoyable, and can help us get through the myriad of emotions that life presents us. 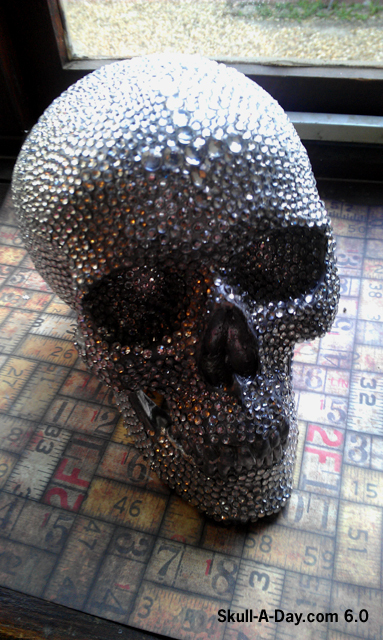 Carina Karlsson in Bristol, Virginia sent us a wonderful tale of how this skull came to be. I would never be able to recap the story in all its glory so if you want to know its origin story visit her post about it HERE. I just can not tell you how awesome this is. For some reason it has never clicked for me that I have this mass of fabric material that ends up in the trash that I could get creative with. Thank you for sharing the process of this creation with us as well as opening our eyes to new art material to get creative with. As school winded down around these parts again until the fall , I had an opportunity to do my part in assisting with the festivities. When I think of school being out for the summer it's difficult not to think of the Glam Prince of Rock and it was his influential ♫ School's out for summer ♫ that assisted me in the process of creating a few non-traditional designs in the batch. My weekly offering of original skull designs were posted on Mondays in year 3.0, you can see all of them plus a few more HERE . Knowing the personal pressures of a creating a piece each week, I tip my hat to the massive one-a-day project that was undertaken by The Skullmaster, during the original Skull-A-Day year. Hopefully you will find some nourishment in my offerings, but if you need more nourishment, you may always Friend me or Follow me in their respective places. 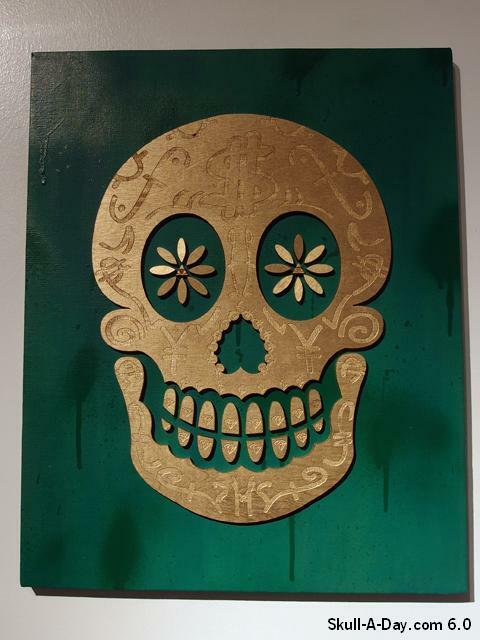 This smiley sugar skull drawing done with ink and colored pencil comes to us from Ty Hunsicker in Akron, Ohio. 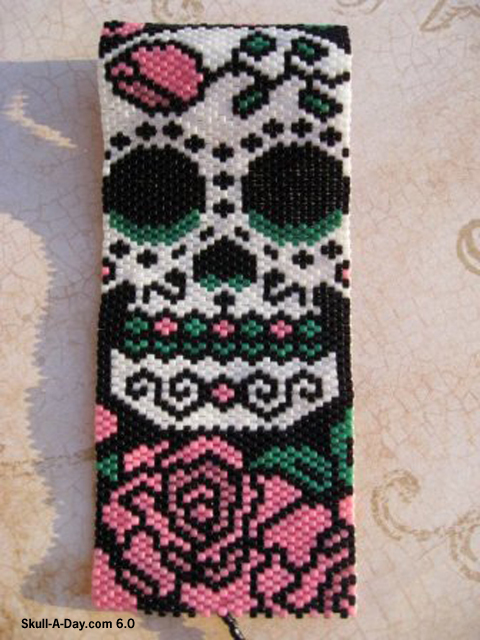 Of course all sugar skulls carry an extra wide smile. You would too if you had such a sweet name. Although, I'm fairly certain that there may have been a girl named Candy somewhere that may have worn a frown at some time. It's possible, just like anything else. Thanks for sharing this sweet smile to brighten our, and Candy's, day, Ty! Most of the ones I own have this extra bump at the top so I decided to try leaving it unpainted giving you a peek inside and making them have a bit of an alien/robot feel. I think these guys need a name. Any suggestions? Also I may start selling these soon. If/when I do, what do you think would be a reasonable price? 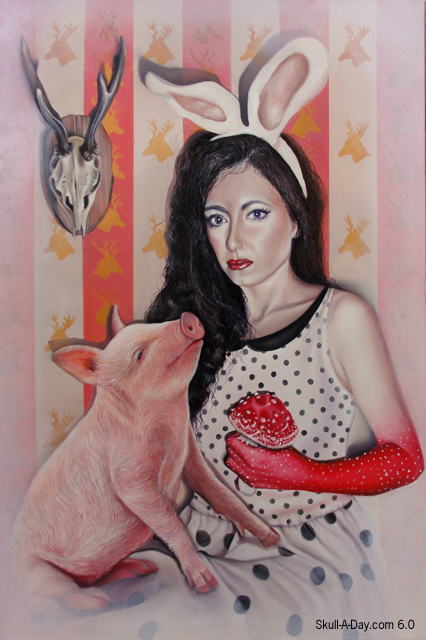 Pascal Peris from Bordeaux, France created these paintings. What draws me to Pascal's work is the pop art influence and the strong lines. 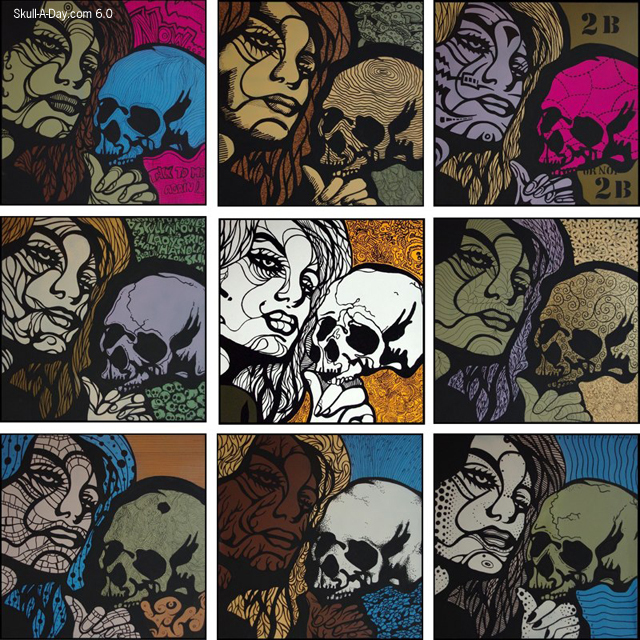 "Lady and the Skull" reminds me of Andy Warhol's screen prints of Marilyn Monroe, and of skulls, however Pascal's work isn't screen printed. The nine images are all hand painted, which leads them to have variations despite their similar composition. "Legs and Skull" has a similar line design in the skull and hands, as the above painted does with the lady. 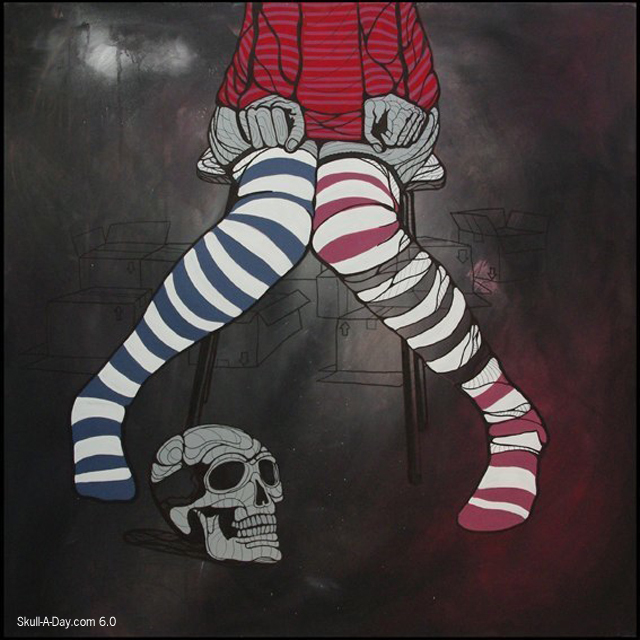 The legs remind me of these long striped socks I have that keep me warm in the death throes of Winter. 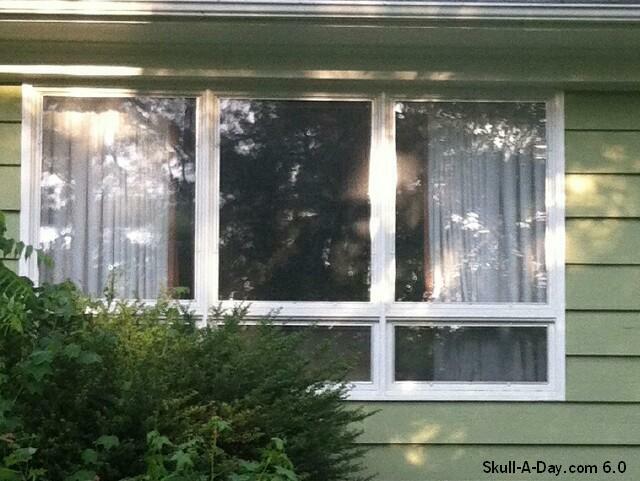 Skull-A-Day collaborator Paul Overton of Dudecraft in North Carolina sent us this picture of a simulacra that was lurking behind the curtains. I feel like I should be calling the police on myself looking at these simulacra. Thank you both for sharing your peeping simulacra finds with us. Apparently I can't stop painting skulls! 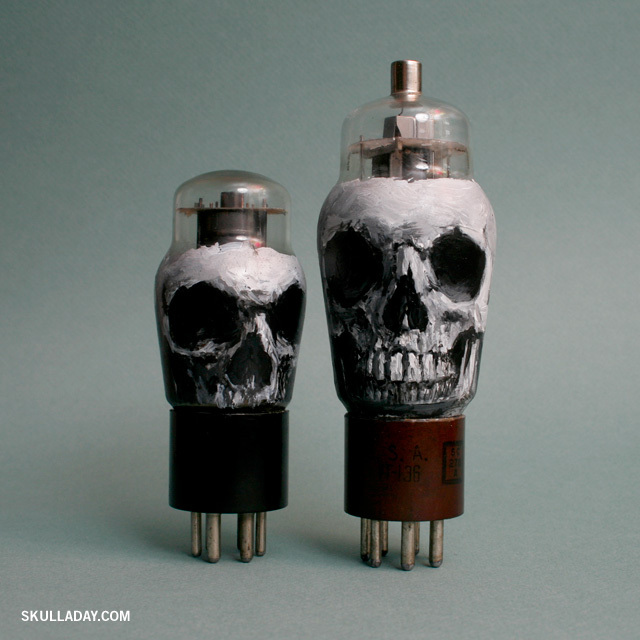 I bought a bunch of vintage vacuum tubes to for another project and decided to try making art on them. I tested out a couple of other techniques before deciding to just paint directly on them. Ben Marcacci, who has been featured here and here, returns with his latest work from the desert titled "Hammered Out & Welded Up". Ben tells us, "It was an exercise in maximizing my free time to create something that is a little rough around the edges, but gets the point across, much like the artist that made it, the country it was made in, and who it was made for, the USMC." Plus he sent us a closer view of the deer skulls he made featured here. 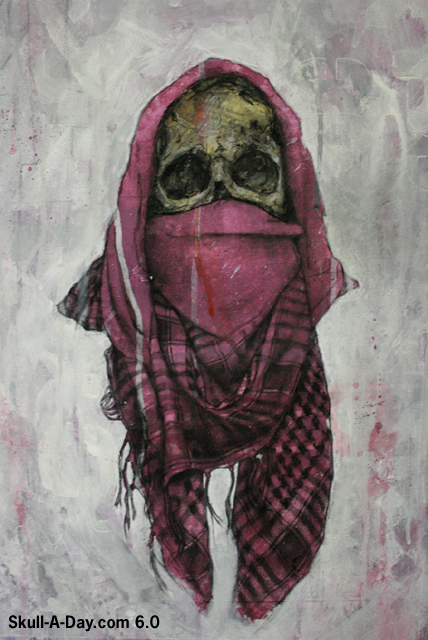 It's good to see that our skull artists remain so inspired even in the most distant of lands. 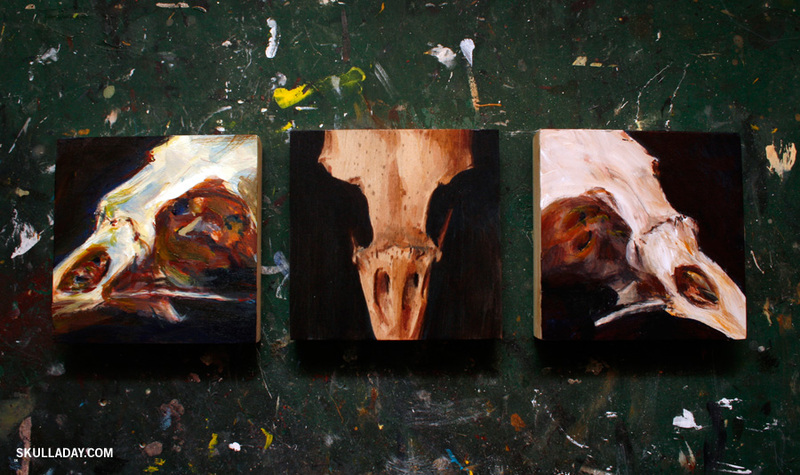 Art and skulls are where you take them and make them. The universe is our playground and we use what we have to make what we want. Ben is a wonderful example of this. Thanks again, Ben! I love the bold, but subtle nature of these pieces. 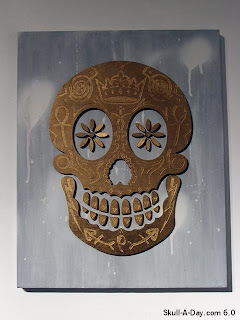 The gold skull on a stark background is quite bold, but a second glance shows that the solid color is not truly solid and the gold skull has much more to offer the viewer. Thank you for sharing your work with us. 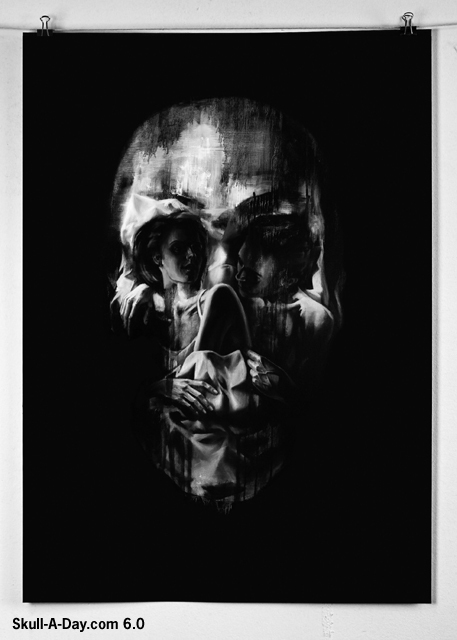 Marta Julia Piórko from Poland, created these two beautiful paintings that contain cleverly subtle skulls. I want to be this lady. 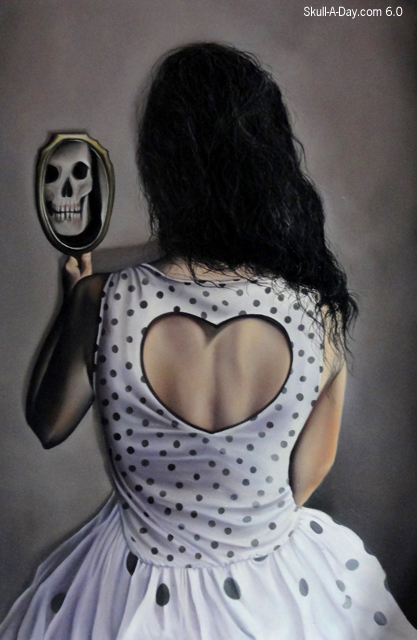 It might be the amazing dress, perky bunny ears, and the skull reflection. The truffle hunting pig companion and decor are a great addition. Both of the pieces are painted beautifully. The textures and shading bring out a haunting beauty in them. Since today is the 18th anniversary of a rather famous crime, this week I wanted to explore the idea of what a chalk outline represents within a crime scene, unfortunately without any defining appendages the minimalist shape turned out rather flat so I added some details. Shanel Silva is here to show us the Joy of Jewelry with her intricate skull glass bead cuff. Shanel does an excellent job with these tiny beads. It's gotta be tough enough to keep them all in order, but the detail she achieves is astounding. You're creating some beautiful stuff, Shanel. Thanks for sharing! Once again the Ekkehard Beck of Designers Skulls is once again seeking out the best skulls in the world to honor in the Skull of The Year competition! However, this year there's an exciting twist, instead of submitting existing work he wants you to help create a unique calendar. Everyone is encouraged to submit their own design for a 2 week spread and the best 24 will be compiled and printed by Ekkehard. There's no fee to enter and winners will get 2 copies of the calendar at printing cost (plus shipping). You have til just August 31 to enter, so get started! Full details, including technical specifications, can be found HERE. I was recently commissioned to created this trio of bird skull paintings in the style of my 100 Painted Skulls project. Each was painted in acrylic on 4 x 4inch (10.16 x 10.16 cm) wooden panels in one of the styles I'd developed during the project. The center is the watercolor style, where the lightest color is actually the visible wood of the panel it's painted on. 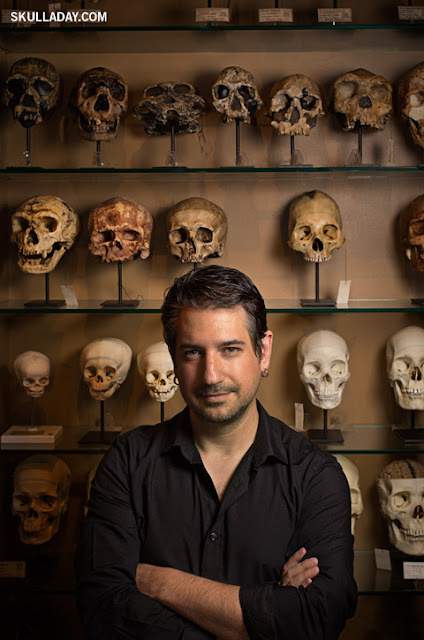 Thanks to my friend Symon Chow for providing the bird skull reference photos for me! Don't forget that you only have until Midnight Eastern time TONIGHT to be entered in our giveaway contest for a signed print of this piece titled "Semblance" from Tom French. Time is of the essence so if you haven't entered yet visit the original post here or click on the ad at the top of the sidebar. I recently received my own print of this beautiful piece and this picture just can't do it justice. It's something better seen in person so don't miss your chance to own one for yourself. Of course you don't have to wait until the end of our contest, or if you want to assure you get a piece of Tom's work then check out his site here. Thanks again, Tom! 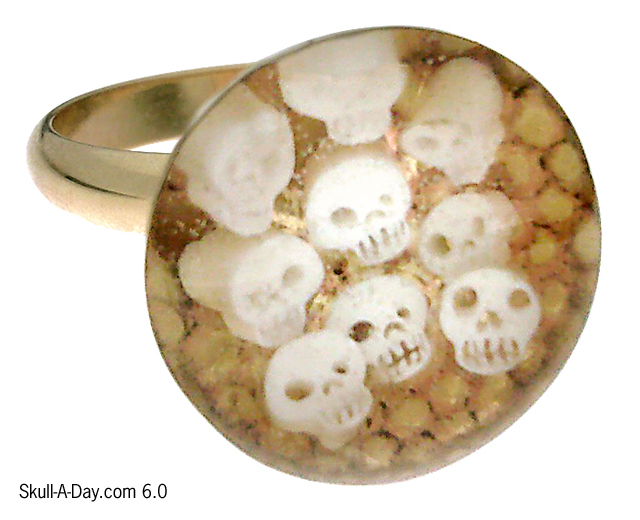 Herbert Hoover of New York, NY created these skull rings for his amazing Ring-A-Day project. I've been steadily following Herbert's Ring-A-Day project since he started. Each of his creations are amazing! 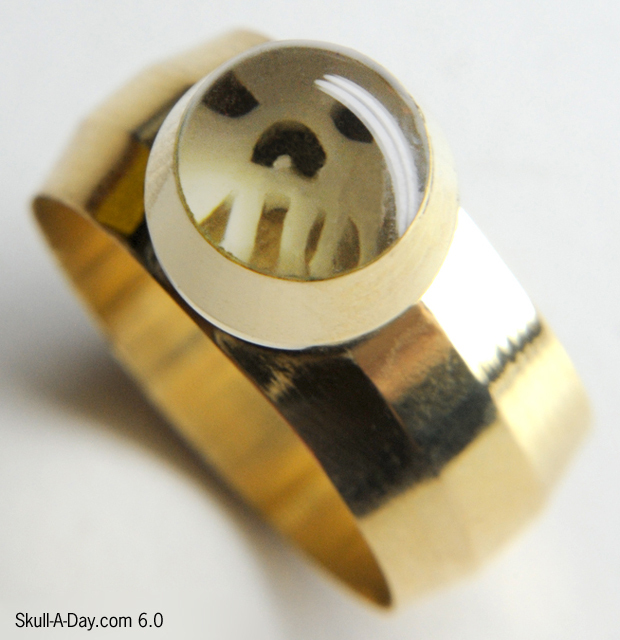 These eerie rings are no exception. The mix of this metal with the white skulls gives the skulls a warmth. The construction is elegant and makes the skulls an unexpected element. Should you want to purchase one of Herbert's creations, visit his Facebook page or Copious shop. Adam Wilburn from Bloomfield Hills, Michigan sent us this picture of a small spill on the counter while cleaning out a coffee cup. 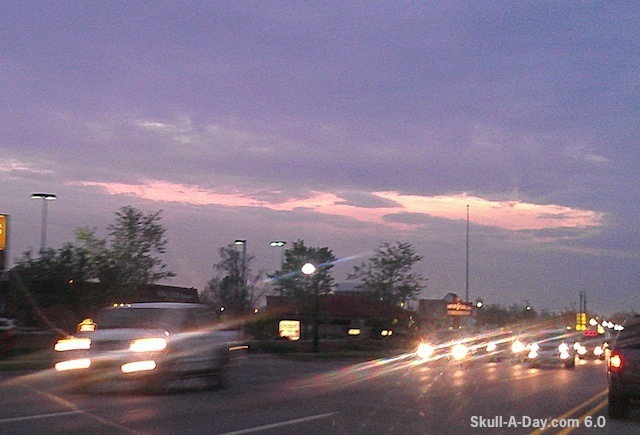 Last week we featured some of the most prolific types of simulacra, rocks. Today we feature another type of simulacra that is just as prolific, liquid. Thank you both for taking the time to record and submit your finds. 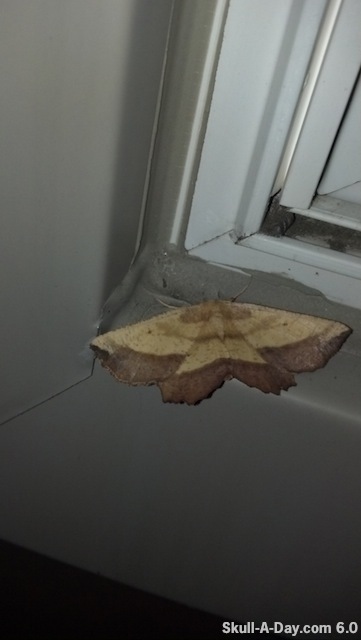 Also, keep sending those pictures in, we always love seeing what our simulacra hunters find. Anyone is welcomed to participate, it's fun and it's easy- if you see a simulacra (skull), photograph it and send those pictures in to our submissions address with a little something about what it is really and maybe a little about you. This old Chinese magazine page has made its travels to Toronto, Canada where Rachel Ho has adorned it with a wonderful skull illustration. Upcycling at it's finest. This passed on piece of printed paper makes for a proper background in Rachel's artful merging. The illustration is impressive and the puzzle looks interesting also. Almost as if it's all that this skull can think of. Thanks for sharing, Rachel! 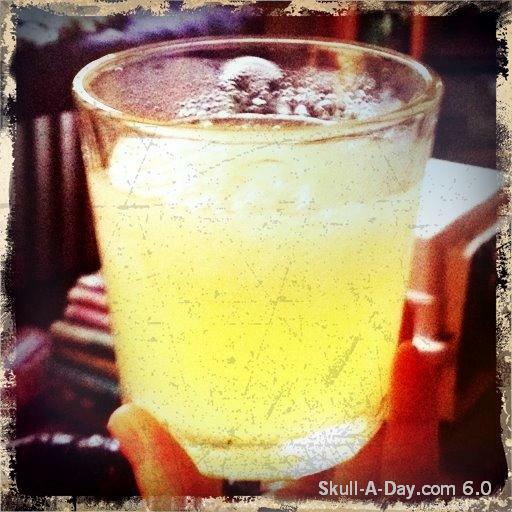 [BONUS] The Gift of Skulls: ARGS! I was invited to give a talk about my work to design students at Appomattox Regional Governor's School (ARGS) today in Petersburg, Virginia; and as a thank you gift I was presented with this wonderful piece of highly detailed skull art made with contributions from several of the students!